Here is knit top #2 from last week’s sewing! Recently, I read a review on PatternReview.com of New Look 6343. So, once again, I downloaded a pdf, printed, tiled, and taped. While this pattern is not from Australia like the pattern from yesterday’s entry, I live 30 miles from a JoAnn’s that might have the pattern, so I can still do the pdf thing faster than trying to get the paper pattern. I really liked the look of those angled armsceyes! The fabric is a pretty green 4-way Swiss nylon/acetate/lycra stretch knit from Gorgeous Fabrics that has been in my stash for a year or so. Their description: “This fabric will be a mainstay of your wardrobe…it is perfect for work, play or travel! It never wrinkles, it washes beautifully, and it’s a joy to sew. It comes from the best knitwear mill in Switzerland.” It feels wonderful to touch and to wear! I sewed this with my workhorse Pfaff 7530. I didn’t feel like getting my serger out, and besides, I don’t have serger thread this color. I am just as happy most of the time sewing knits with my regular machine. I stitch the seams with a zigzag (W = 1.0, L = 2.0), then stitch again about 1/8″ away in the seam allowance, and trim the seam allowance to 1/4″. I didn’t download the instructions, so I’m not sure if they tell you to set the sleeves in or sew them in flat. 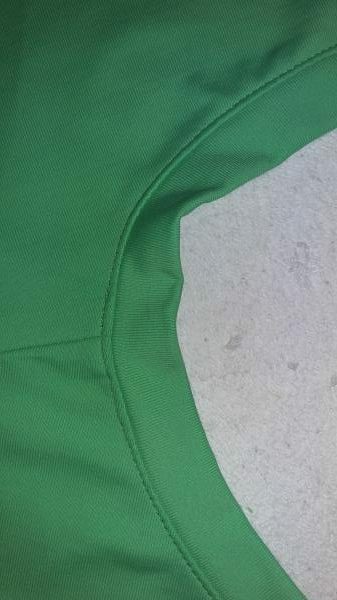 I always prefer the fit of set-in sleeves, but I knew this would be a bit tricky with the two corners (the back sleeve line has the same nice corner angle as the front.) So I did a cheater set-in sleeve. 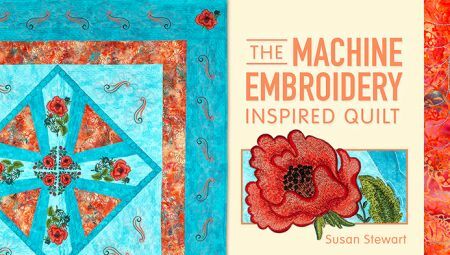 I set the sleeve in flat, clipping and pivoting at the corners, but I started stitching about 2″ from the side seam at the underarm, and I stopped stitching about 2″ from the side seam. Next, I stitched the side seam and the sleeve underarm seam. Then, it’s easy to stitch the remaining part of the armsceye seam. I topstitched the seam to make it a little more noticeable. I changed the length of the sleeves, and shortened the tunic length to hip length. Now, here’s my tip! Sometimes, when I make a knit neckband, it doesn’t want to lie flat all the way around the neck, especially at that sharper curve of the neckline just behind the shoulder seam. Some knits are very soft and ease easily, but this was a somewhat firm and very “snappy” knit. Here’s what I did to fix this! Thread a large darning needle (they have blunt tips and large eyes) with a doubled length of elastic thread, more than long enough to go around the neck. Slide the tip of the needle between the stitches of the neckband seam. You don’t want to pierce the fabric, just go between the stitching. Thread the elastic all the way around the neckline, being careful not to pierce the fabric. When you reach the starting point, slide the needle out of the same stitch into which you inserted it. Pull out the elastic thread tails, and un-thread the needle. Now, gently stretch the neckline and work the ease so that the neckband lies flat – you don’t want gathers. The elastic is not pulling up the neckband, just controlling those little floppy parts. When the neckband is the way you want it, tie a secure double knot in the elastic, and trim the tails. You can put a dot of seam sealant on the knot, if you like, and allow to dry. Then, work that little knot back through the seam, into the neckband. You can use the eye end of the darning needle to help, plus a little stretching of the band. I know I’ll wear this top a lot, and I know I’ll use this elastic thread trick a lot, too! I’ve made three new knit tops for myself this past week. I love sewing beautiful dress clothes, but, really, I live in knit tops and shorts and jeans. All the time. So I dug in my stash, downloaded a couple of pdf patterns, and started sewing. The first top I made was Style Arc’s Ann T-Top. It is one of their promotional patterns on etsy, and costs less than $4.00. Or, you can download it for free if you are a PatternReview.com member. Of course, you have to print and tile the pattern, but it’s a lot faster than waiting for shipment from Australia! I found a pretty poly-lycra print jersey on my shelves (from Gorgeous Fabrics a few years ago, I think.) I rarely wear prints. I don’t know why. They catch my eye, but I almost always go for solids. But in this case, I had purchased a couple of pairs of shorts from Sam’s for $9, and I needed something to wear with these bright pink ones. This print was perfect! 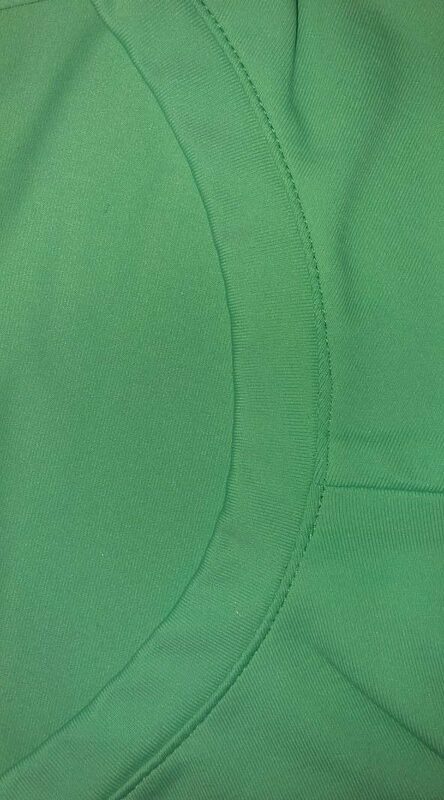 This pattern has a bit of shirring on the front at the side seams. It’s nice, although I think it would look better if I had made a smaller size. The pattern suggested using narrow elastic to gather up the front side seam allowances before stitching the side seams, but I just used gathering threads to pull up the slight gathers. I didn’t want the extra bulk of elastic, and the gathering worked just fine. I lengthened the sleeves to elbow length, and finished the lower edge with a band instead of turning up a hem. The neckline is a nice scoop shape – not too low, not too high. Watch for my next blog for a trick to help with knit neckbands! This blog post isn’t about sewing at all! But when a photo I put up on Facebook a couple of days ago of some frozen basil pesto cubes I made got just about as many “likes” as some of my prettiest sewing projects, I thought I’d write about it! Every spring, Mark fills a big planter with basil plants so I can harvest fresh basil during the summer. When the plants are full and fragrant, I make basil pesto. I usually get half a dozen big batches a year. It’s soooo good! Basil leaves, garlic, Parmesan cheese, toasted pine nuts or walnuts, and olive oil – the sum is so much more than the parts! Because I have a lot more than I can use at once, and it doesn’t keep all that long in the fridge, I freeze it. Yep, in cheapie old-fashioned plastic ice cube trays. I pop the frozen pesto cubes out of the trays and store them in zip-top freezer bags. The pesto stays fresh all year. When I want to add this culinary green gold to food, I just get out a cube (or two or three!) Sauces, chicken, fish, burgers, veggies, soups – just about everything tastes great with this stuff added. I try to get a big bag of pesto cubes to Annie each year, as well. Chipotle cubes. Chopped chipotles in adobo are yummy in burgers, some soups, mixed with sour cream on fish tacos, or mixed with mayo as a sandwich spread. For a while, I would open a can, use what I needed, and end up throwing away the rest, because it’s not something I use every day. Then it came to me – make good use of those ice cube trays again! So I chop up the entire can (or usually two cans at a time), freeze into cubes, and store in baggies. Again, I can take out what I want anytime I need it. I don’t have any in the freezer right now, but I also freeze chopped sage leaves in olive oil in my ice cube trays. I never liked dried sage, but then I tried fresh. Yum! Try it in turkey burgers. Ground turkey can be very dry, but a sage and olive oil cube, warmed up and mixed in, keeps the meat moist and very tasty. Or spread the sage/oil on top of pork roast. I get those huge pork loins from Sam’s, and when I get home I cut them into pork roasts and pork chops. Again, those very lean pork loin roasts can be dry, but that sage/oil on top keeps it moist. And butternut squash with sage is delicious! Rosemary chopped and mixed with oil and frozen is good, too. Cut or slice potatoes and mix in some rosemary/oil, then roast. Or use the same way as the sage on a pork roast. Rosemary is such a strong flavor that I make smaller cubes. I’ll make thyme cubes, too, if I can find fresh thyme. These are great in soups. I’ve also had suggestions to make cilantro cubes, and I think I’ll do that, because I rarely use a whole bunch of cilantro before it goes bad. Fresh ginger. Such a fragrant and tasty addition! It’s not something I use every day, and the ginger would get moldy in the fridge before I used it. So, I peel it and store it in the freezer. All I have to do is grate what I need. This Microplane grater makes easy work of it. I don’t have a lot of kitchen gadgets (just like my sewing) but these graters in several sizes are things that I use often. Again, no picture because I don’t have any in there right now, but red curry paste is another thing I like to keep in the freezer. I only use it a few times a year, so I spoon out tablespoon-sized mounds onto waxed paper, freeze, then store in baggies. On the last things on my “seasoning shelf” are bags of chopped Hatch green chiles. I don’t live in an area where these are available, so I preparee my own. Once a year, for about two weeks, I can buy these chiles. So I go through the process of charring, steaming, seeding and chopping the chiles. That’s more work than I like, but they are so good, and it’s so nice to have them to use. I especially like these on cheeseburgers and mixed into scrambled eggs. Yummy!